Wind shear refers to a change in wind speed or direction with height in the atmosphere. Wind shear can also refer to a rapid change in winds over a short horizontal distance experienced by aircraft, conditions that can cause a rapid change in lift, and thus the altitude, of the aircraft. 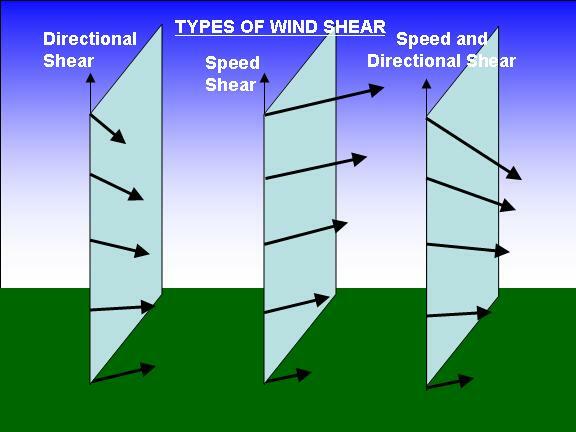 Some amount of wind shear is always present in the atmosphere, but particularly strong wind shear Wind shear is important for the formation of tornadoes and hail. Larger values of wind shear also exist near fronts, extratropical cyclones, and the jet stream. Wind shear in an atmospheric layer that is clear, but unstable, can result in clear air turbulence. MAKING AIR TRAVEL SAFER Many airports now have wind shear detection equipment near the ends of runways to warn aircraft if it is too dangerous to land.